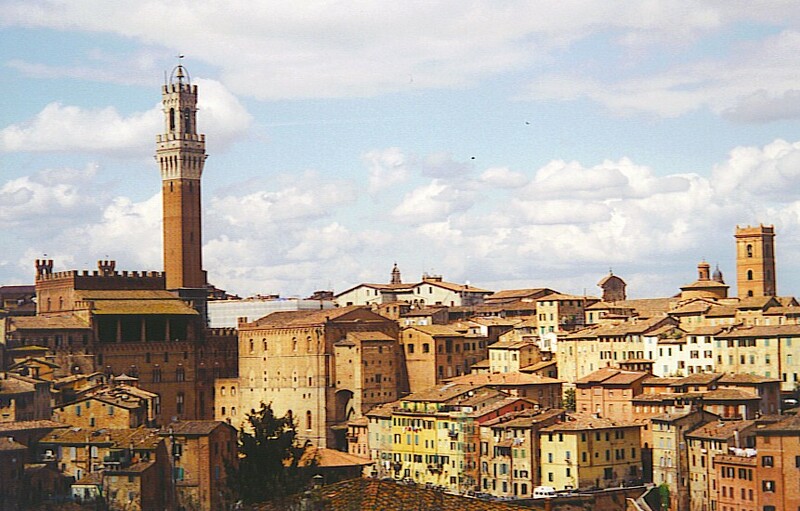 Siena was once a Ghibelline stronghold. When I’m traveling, there’s something strangely amusing to me about the local news. Maybe it’s because the hot-topic issues in Sydney or Seattle that are being so passionately debated by residents are irrelevant to me. It doesn’t change my life if the town council votes to knock down the old water tower over by the high school, but there are people who are so vehement about it one way or another that they can be seen on news broadcasts snarling at each other and turning purple. There is something about human nature that compels us to take sides, opposing on principle what the other side favors. You can probably think of many examples — or maybe you can’t, just because I said you can. For the moment, though, let’s consider the Guelphs and the Ghibellines. They were two Italian factions that fought each other for centuries during the Middle Ages. The Guelphs supported the Pope, and the Ghibellines favored the Holy Roman (that is, German) Emperor. The issue was whether the Italian city-states wanted to be led by a spiritual power or a temporal power. That philosophical debate lasted for, oh, a few minutes. Then each side tried to demonstrate the moral superiority of their position by slaughtering their opponents. In the process he created a new bit of folk wisdom: “Don’t try to swim when you’re wearing sixty pounds of armor.” Frederick and his horse both drowned in the swift current of the Saleph River. Over the next hundred years or so, Italian cities aligned themselves with one faction or the other. Florence, Bologna and Genoa were predominantly Guelph; Pisa, Siena, Arezzo and Modena were Ghibelline. They fought incessantly, but the issue of spirtual versus temporal leadership was only one excuse for antagonism. The rivalries between cities were also fueled by property-holding nobles vs. middle-class merchants. In 1325, Guelph Bologna and Ghibelline Modena even battled over a bucket stolen from Bologna; 2,000 men died as a result of that provocation. Eventually the Guelphs prevailed in Italy, but it was only a matter of time before they began fighting among themselves. In Florence they split into factions known as Black Guelphs and White Guelphs. The poet Dante was on the wrong side of that division — many other White Guelphs were killed; he was exiled. It took a while, but cooler heads finally realized the injustice that had been done to Dante. After a civilized discussion, the city council of Florence rescinded his sentence… in 2008, which was about 700 years after they kicked him out. Thankfully, that decision did not start another war. This entry was posted in History and tagged Florence, Frederick Barbarossa, Guelphs and Ghibellines. Bookmark the permalink.